Well, I got more of an adventure than I bargained for on Friday. We worked in the morning until about 12:45 and then George, Bogdan, Diana, and I piled into George's car to head toward Sibiu, a central town about a three hour drive from Cluj. However, earlier in the week we had been discussing going to Turda, a nearby town about 20 minutes away, so I was mentally prepared for that. But apparently these guys were enthusiastic about such a long round trip journey so off we went, George aggressively passing cars and trucks as we zipped along the windy 2-lane paved road that serves as the interstate highway. The roads here don't quite cut it as highways: not enough lanes, constant curves, and no concept of exits so the highway just goes right through the center of every town you pass, causing a multimile traffic jam at every city. But off we zoomed, stopping along the way at a great roadside bistro for lunch. At George's recommendation I ordered the chicken goulash, which was by far the best meal of this trip. 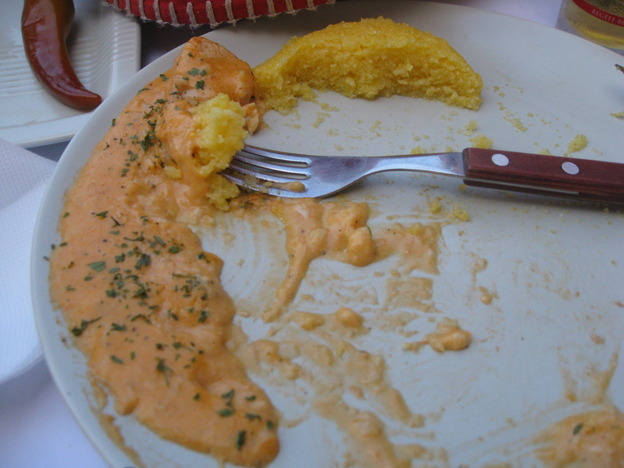 Chicken pieces in a pinkish goulash sauce with a side of polenta. Delicious. It was a really great meal. We sat outside but in the shade. George and Bogdan ordered a large piece of pork that came with a large piece of boiled pork skin that was like nothing I've seen before. My best guess would have been that it was tongue of some kind. They also had an enormous vat of soup. Diana had the chicken and ham dish that was my original choice prior to George's recommendation and a funny fancy chocolate milkshake. 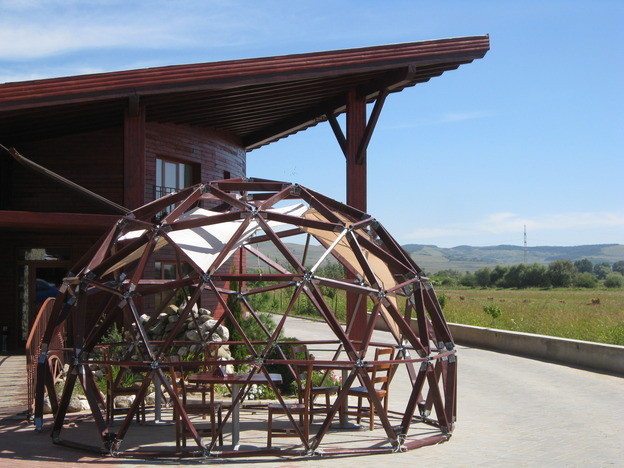 The restaurant had several sections of tables inside large wooden geodesic domes made out of stained boards joined with steel connectors. That is about as close as I'll get to Burning Man this year, I guess. After the delicious lunch we were off again, hitting some traffic at Sebes, some of which George avoided by simply veering off the highway into the residential streets in frustration, following some locals, winding our way to the other side of town, and rejoining the highway again. 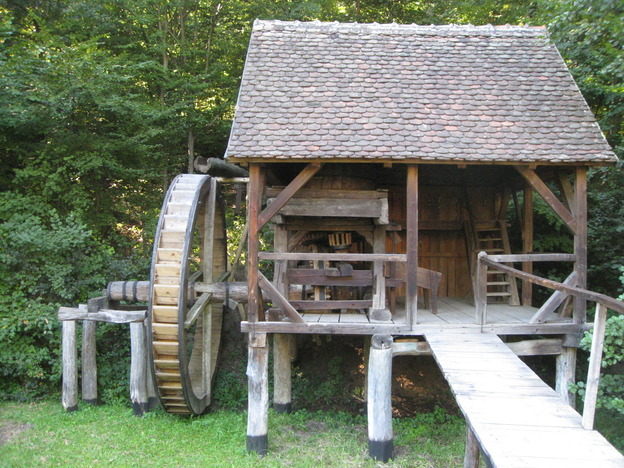 Sometime around 4:30 or so we arrived at the large outdoor technology museum outside Sibiu. Here they have a lake and large grounds surronding it. They transport various buildings from the past few centuries from every region of Romania and reassemble there here as a museum and park. 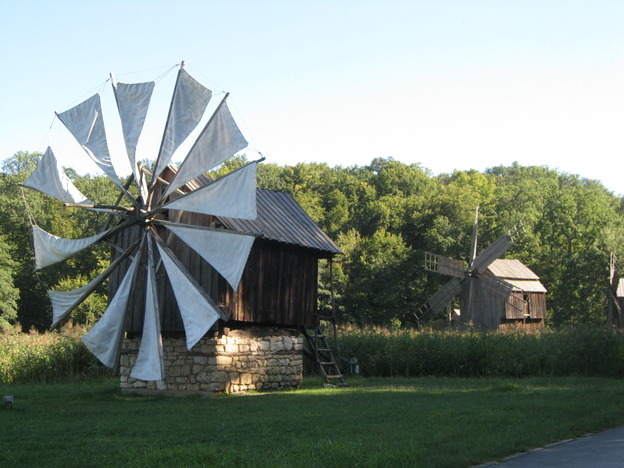 It has lots of windmills, water mills, sawmills, seed oil extraction buildings, and a few churches. We toured around a good long while before hopping back into the car to visit downtown Sibiu. 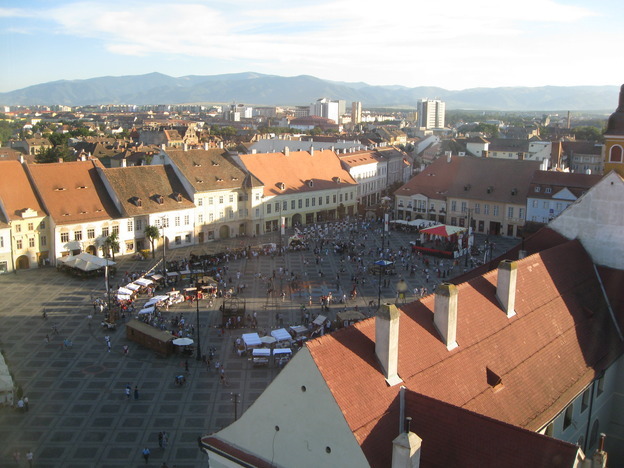 Sibiu is a walled fortress city and just by sheer chance there was a large Medieval Festival happening this weekend, so the large cobblestone pedestrian malls and plazas were buzzing with people. The temperature had cooled down and it was quite lovely. We saw some sword fighting, torch fighting, some music performances, and lots of costumes. We also went into some churches and climbed up to the top of the clock tower to enjoy some vistas. We had a nice lazy small dinner followed up with soft serve ice cream. There are young girls operating very small portable soft serve machines for 2 lei (about 60 cents or so) a cone about every 100 meters along the pedestrian mall in Sibiu. Then we made again the long journey back to Cluj, but this time except for one or two brief backups, there was no traffic, so George was zipping along between 120 and 160 kph most of the way, taking the curves like a race driver. We got back to Cluj shortly after midnight. I certainly wasn't expecting such an adventure! I had just a few hours to rest and shower before I had to head to the airport for my Cluj -> Bucharest -> London -> Denver journey home. The rest of the photos from the Romania trip are here .